What is this girl made of? My experience with a home DNA test | So what? Now what? 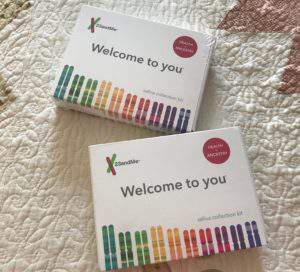 Little girls may be made of sugar and spice and everything nice, but when I wanted to know what this grown-up girl is made of–literally–I ordered a DNA kit from 23andMe. In today’s post I’ll tell you about my experience with a home DNA test. I started by reading reviews of the two most popular kits, 23andMe and AncestryDNA. After reading Fit Bottomed Girls Guide to DNA Kits, I was sold on the health and trait reports provided with 23andMe. Larry decided to play along with me, so I ordered two tests. The first one was $199, and we got a discount on the second one, making it $179.10. We ordered the kits on July 15 and they were in our post office box by July 21. The test is easy to take. Go one hour without eating or drinking anything. (This was hardest part for me!) Then simply spit into a saliva collection tube until you reach the fill line. The tube looks small enough in your hand, but I confess it took some effort to generate that much saliva. Once it’s full, just seal the tube, put it in the specimen bag, and mail it back in the pre-paid box–all part of the kit. Then we settled in to wait. The 23andMe website warned us it could take six to eight weeks to analyze our specimens. So I was pleased when less than four weeks later, I received an email that our reports were ready. 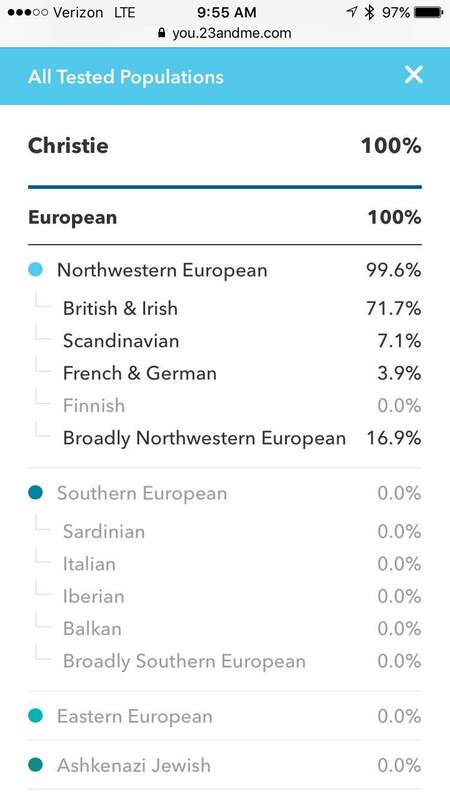 I was curious to see whether the DNA results would support what I knew of my genealogy–and it did! My ancestors are primarily from England and Scotland and some from Germany and Denmark. As an added bonus, I learned I have 294 Neanderthal variants (more than 74 percent of 23andMe’s customers). I guess that means you may feel free to call me a Neanderthal! I learned I am genetically predisposed to weigh more than average (boo! ), less likely to sleep deeply (sad, but true), and I share a variant in muscle composition with elite power athletes (surprise!). Information is provided on a total of eight wellness factors and 16 traits (such as the likelihood of having dimples, a cleft chin, curly hair, and other things like that). I also received information regarding genetic variants that may increase my risk of developing certain health conditions. You have the option to decline this information if you’d rather not know. I decided to get all results. If they looked good, great. If not, I would have the information to share with doctors and family members. As it turned out, I had single variants that could slightly increase my risk for late-onset Alzheimers and hereditary thrombophilia (a predisposition to developing harmful blood clots). Since I only have one variant in each string, the threat is minimal, but I now know to take lifestyle precautions so as not to add to the risk. All in all, it was an enlightening and entertaining experience. If you’re curious about your genetic make-up, I would definitely recommend 23andMe. Have you taken a DNA test? Which one? Any surprises? Have you done your genealogy? Where are your ancestors from? If you said yes to both, did the genealogical research and the DNA results line up? Thanks for sharing this, Christie. 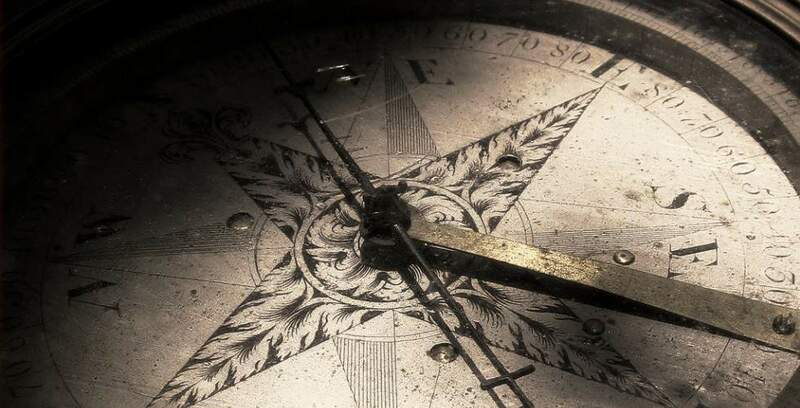 I believed that working on my ancestry was one of the first things that I would do in retirement. Somehow, I haven’t quite got around to it yet. Your post was a great nudge in this direction! I used to go with my mother to the genealogy library here in Salt Lake City, and we’d look through the microfilm. Of course, now you can do it all online. Cool! I wonder how our ancestry would be the same and different? Yes, Connie, that would be interesting? Do you know anything about your father’s genealogy? Of course, Mom has traced hers way back. I love this Connie. I miss Grandma Nokes. A DNA test could be very interesting for you. I miss her too. Remember the maxi dresses she made us as a reward for not chewing our nails? Yes, I loved that dress. Enjoyed reading this. My genealogy shows my ancestors coming from England and Ireland mostly but there is Native American ancestry in there too. Haven’t done the DNA test yet. Thanks Dee. I found doing genealogy to be so interesting. I may have to get back to it when I retire. Should you decide to try a DNA test, I’d love to hear what you think of it. Thank you Christie for linking up and co-hosting with me at the #BloggingGrandmothersLinkParty. I shared your post on Facebook, Google+, Pinterest, and Twitter. My cousin did this Christie and had some very interesting results. I’ve yet to try it. Thanks for sharing and co-hosting #BloggingGrandmothersLinkParty and I’ve shared on social media. Thanks Sue. If you decide to give it a whirl, I’d love to hear what you think. I haven’t taken one, but I really want to. My sisters and I purchased one for our mom for her birthday and we are waiting for the results. It sounds so interesting! Thank you for sharing your experience on #BloggingGrandmothersLinkParty! I’ve shared on my social media. Thanks Teresa. What a fun gift for your mother. If you decide to take one, I’d love to hear about your experience. Christie, I first started working on genealogy when I was a teenager. So I did a great deal of work the old-fashioned way before Ancestry.com came along. I did the Ancestry DNA thing and found no surprises there. Would be nice to have the health details as well, but I won’t be doing the other test as well. I also did my genealogy the old fashioned way, Jean–going in person to the genealogy library and looking at microfilm. It was kind of exciting though, and I got to spend lots of time with my mom there. Thanks for checking in. I did the Ancestry DNA test and was disappointed in the minimal amount of information they gave me. Unless I just don’t know how to find out the details, I was only give the % ethnicity. I am 100% European (80% Great Britain, 8% Finland/NW Russia, 5% Ireland, 4% Europe West, 2% Iberian Peninsula, <1% Scandinavian). I was very interested to know these percentages, but was expecting more information. I wonder if any one else did this test and knows about getting more info? I’m not sure if there is more information available from Ancestry DNA. I do know from my research that 23andMe provided the most health information. That’s why I went with them. 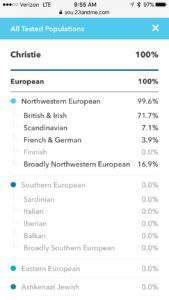 I hope you get some input from others who are more familiar with Ancestry DNA. Thanks for checking in Nikki! Yes since I did this they have been sending me other people that had DNA matches with me such as twice removed cousins, etc. They have been sending me the names. I had the same experience, Betty. They let you decide if you want to have your name shared with relatives, so that’s kind of fun. I never thought about doing this but your post is an inspiration. I might give each of my grown kids a kit as a holiday present. always looking for something different to give them. a little bit of their personal history. That sounds like an excellent gift idea. Now you’ve inspired me! Thanks. I took the DNA test also. I was pleasantly surprised with mine. Thanks for sharing. I had someone read my cards once–purely for entertainment–and I quite enjoyed it and was impressed by her perceptiveness, her ability to read me. There was information in my DNA test that may perhaps be useful, but again, it was mostly entertainment. I agree that as far as health goes the general rules of eating well, getting plenty of rest, and being physically active are good for everyone! That must have been incredibly interesting! My sister got a DNA test from her daughter for Christmas. Her results supported some speculations we had about our paternal grandfather. DNA technology is amazing! What a lovely surprise! Thanks Dee.